Originally published in the 1980s, this classic volume, reissued in 2011, focuses on the most critical strategic activity in any organization, namely, who gets chosen to sit in the top echelon of the pyramid. 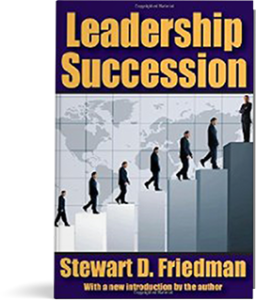 Friedman argues that it is the quality of corporate leadership that will determine corporate winners and losers in the global competitive game. The stakes in leadership succession are high. The selection of key figures is the one human resource activity that no one belittles for being of secondary importance. Indeed, leadership succession is so important and central in many executive minds that it crowds out any other work. The succession process is often fraught with political intrigue, it lacks discipline, and excludes meaningful involvement of senior human resource executives. The contributors to this imaginative volume reveal a succession planning process that is frequently sloppy, superficial, and regularly sabotaged by senior management when they give it short shrift in terms of quality time. In addition, senior management often overrides sound decisions when it comes to filling key positions. The result is a lack of integrity throughout the human resource systems that eventually leads to a collapse of belief in the system and its governance.